Excuse me ... the download of this record gives you 2 files - one (Side 1) with 12.47 m and the other (Side 2) with 26.45 m.
I made a quick research and I think that the second longer file contains the entire original LP. 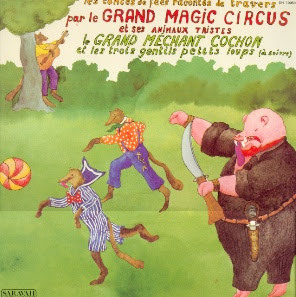 Le Grand Méchant Cochon Et Les Trois Gentils Petits Loups (Saravah: C-LP 26m)"
DALBRAY Muse [Auteur d'une oeuvre littéraire] / LASRY Jacques [Auteur de la musique] / GRAND MAGIC CIRCUS / SAVARY Jérôme [Mise en scène (opéra)] / MONIRYS Sabine [Illustrateur-dessinateur." 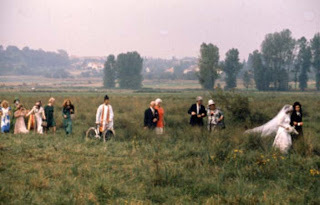 Le Grand Magic Circus was a troupe created by the producer Jérôme Savary in 1965 (it became Le Grand Magic Circus et ses animaux tristes in 1968). Just back from a quick holiday...and....WOW!!!!! AND, THANKS!!!!!!!!!!!!!!!!!!!!! Just discovered this blog the other day and have been pouring its contents nonstop into my ears. Thanks so much for your efforts and generosity. posting here just because I've been trying to get a reply in the old Tolerance - Anonym post but after two posts by me over a couple of weeks, I haven't got your attention. Could you please check out my question and respond? Thanks very much! rock, metal, lo-fi japanese pop, obscure recordings, and comedy/novelty records all here with much more to come. I've just begun this blog and sharing some interesting bits of my collection, so i hope you can swing by and check it out. also, i would like to add a link to your blog on my front page, if possible; and i hope you can do the same for me. i love your postings and look forward to hearing from you. Thanks for all of the NWW list postings ... and some of the other rare/experimental music, too. Great stuff! anonymous - someone brought that up about the tolerance album in the comments to another post (the M.B./W.B. one I think), and i addressed it, so i did not think to reply back to the tolerance post even though i probably should have. basically, the conclusion we came to was that i did not rip the record myself so it very well could be missing something, though i'm more inclined to think it's not - however, if someone can confirm the full length of the album (atlantisaudio maybe? ), then by all means they should do so...if it's not the full album then we definitely need to hear the rest; what we have of the album already is wonderful, so if there is any more, it should be heard. i figured i'd keep it up anyway though because it's rare enough that at least people can appreciate what part of it that is available. thanks for all the information and comments from everyone else.